Förderverein Industriedenkmal Radom Raisting e.V. The radome at Raisting was built in 1963/64 as Germany's first commercial Earth station for satellite communication. It is located some 50 km outside Munich in the picturesque Upper Bavaria region, near lake Ammersee. The entirely air-supported radome houses a dish antenna 25 m in diameter. Until 1985, when more economical solutions came up, the antenna was used for intercontinental television and telephone communication by Germany's former federal post service. Together with comparable stations throughout the world, the radome at Raisting marks the dawn of the new era of globalisation. The radome had huge impact to the culture of communication and contributed to the social perception of the Earth as "global village". For example, in 1965 numerous satellite telephone channels began to bridge the distance between Europe and North America, and in 1969, the Apollo 11 lunar landing was transmitted to European TVs using the radome. The technology employed at the radome, pioneering in the 1960s, also set milestones in a number of scientific disciplines. 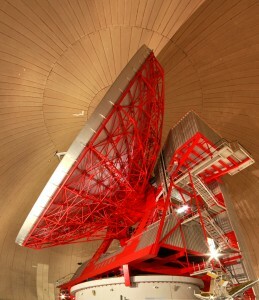 Today, the antenna is still functioning and is occasionally used in scientific and educational projects. Both the radome and the antenna are declared a historic monument of national relevance and are property of the local district. The entire building underwent a comprehensive refurbishing campaign that was conducted in line with good heritage conservation practice. This included the installation of a new yet similar radome. A non-profit association, Förderverein Industriedenkmal Radom Raisting e.V., who operates this web site, plans to open the radome to the public from May 2013. Further information on this will be published at this place.